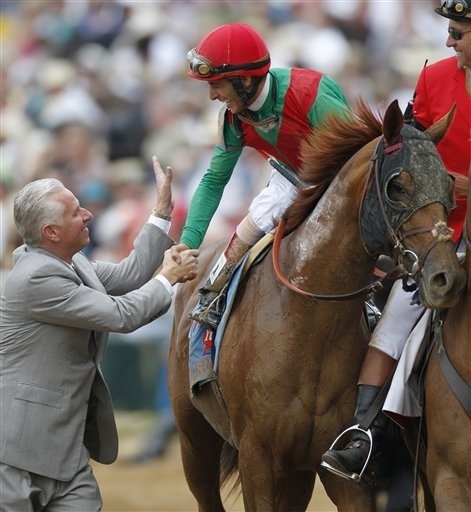 Congratulations to Animal Kingdom and John Velazquez for winning the 2011 Kentucky Derby! 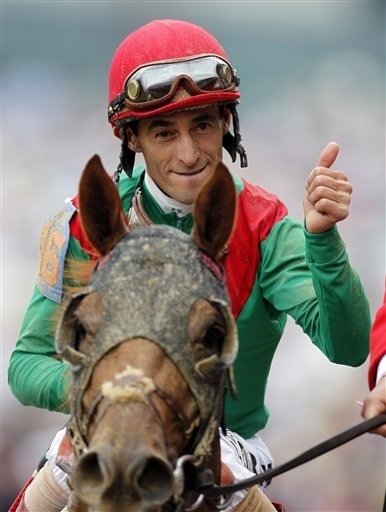 LOUISVILLE, Ky. (AP) John Velazquez won the Kentucky Derby by a broken nose. An injury to Animal Kingdom's regular rider, Robby Albarado, cleared the way for Velazquez to pick up the mount on the 20-1 long shot. Once he took the reins Saturday, he rode his good luck all the way to the winner's circle. "For once, I'm on the good end of it," Velazquez said. "All of a sudden I pick up this one and he wins the Derby, so it was meant to be." The last three years, the New York-based jockey came to Churchill Downs with a colt considered a leading contender, only to have it withdrawn. This time, he was supposed to ride early second choice Uncle Mo before the colt was scratched due to a lingering stomach problem. Then Albarado broke his nose when he was thrown off his horse and kicked in the face before a race three days ago. Animal Kingdom, who had never raced on dirt before, reacted to his new rider the way a champion should, charging down the middle of the stretch to win by 2¾ lengths in front of a crowd of 164,858, the largest in Derby history.